Visiting Buenos Aires was a bit bittersweet for us. 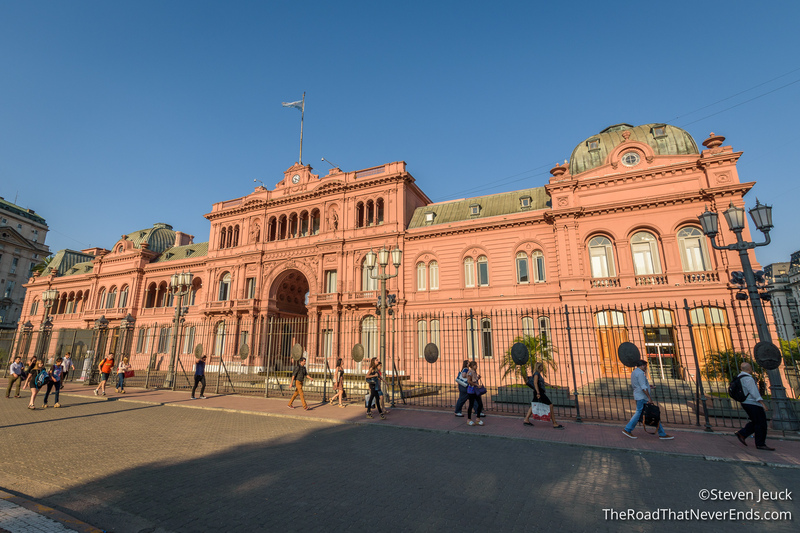 Although we were excited to see the capital of Argentina, it was the last stop on our South American adventure which seemed to go by too fast. 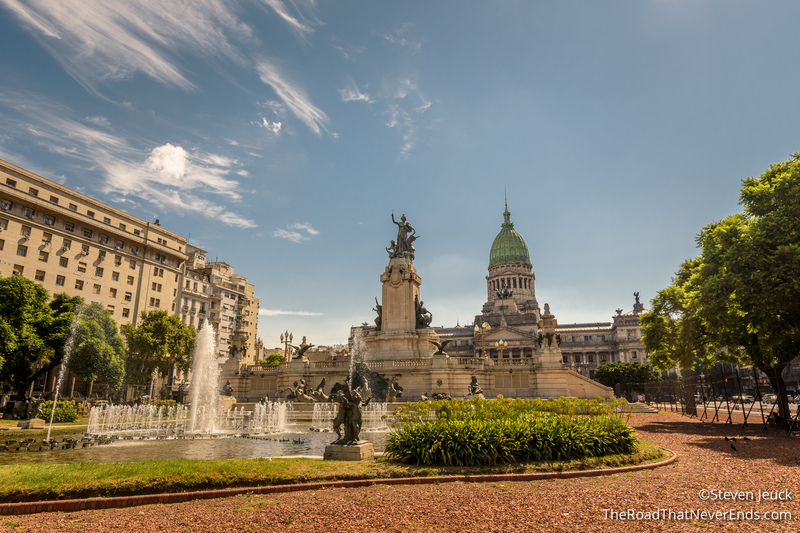 Buenos Aires, similar to Santiago, is a fast paced modern city which we enjoyed immensely. Our stay there suffered minimally with Steve not feeling well for 2 of the 5 days we were there as well as some heavy rain a few days. We had dropped our car off at the airport, and took a city cab to our apartment. Uber does exist in Buenos Aires, and is very easy to use. Unfortunately, Uber isn’t well liked by the taxi drivers and police, so getting picked up at the airport is essentially impossible. Upon leaving the city, we took Uber to the airport and the driver asked Steve to sit in the front because he didn’t want to have any trouble. When we left him he told us to pretend we knew him and gave us a kiss and hug when we left. We are not sure if all Uber airport drop-offs are like this, or just our particular driver. Throughout the city we took their underground metro to get around. It was extremely easy to use. Our host at the apartment had left a metro card, which you can add money to. The metro ride cost is per entry (similar to NYC and Paris) and for that reason, the card can be shared between many people. We enjoyed a one-bedroom apartment from Airbnb. Our neighbors gave us the keys, and we had plenty of grocery stores and restaurants to keep us full. Our apartment was also a five-minute walk to the underground which was great! 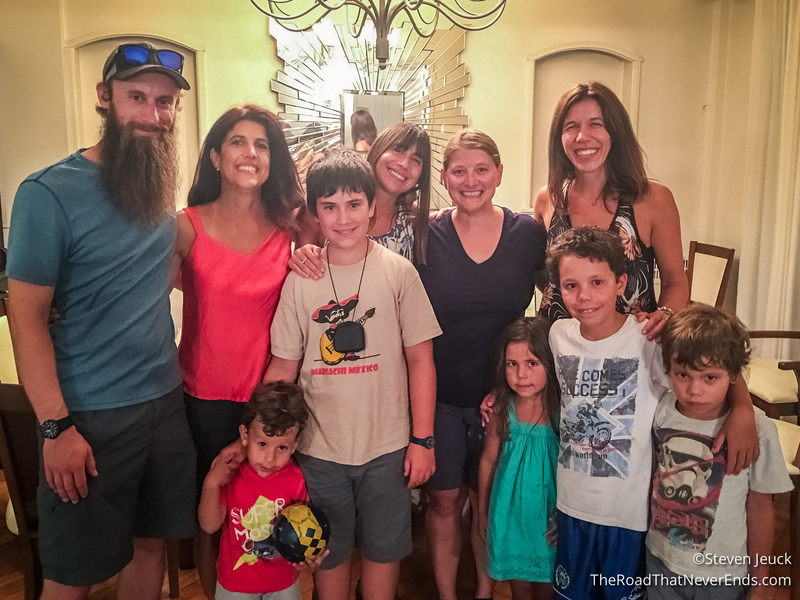 We were excited to visit some family while in Buenos Aires. Although, not technically family, my Uncle Al (“Uncee” Al) set us up to meet his cousins who live in Buenos Aires. I was thrilled to see a familiar face, because they look much like Al and his sisters! Millagos, Luz, Sofi and Angeles, their husbands and children were generous to invite us over for dinner and a lively conversation! 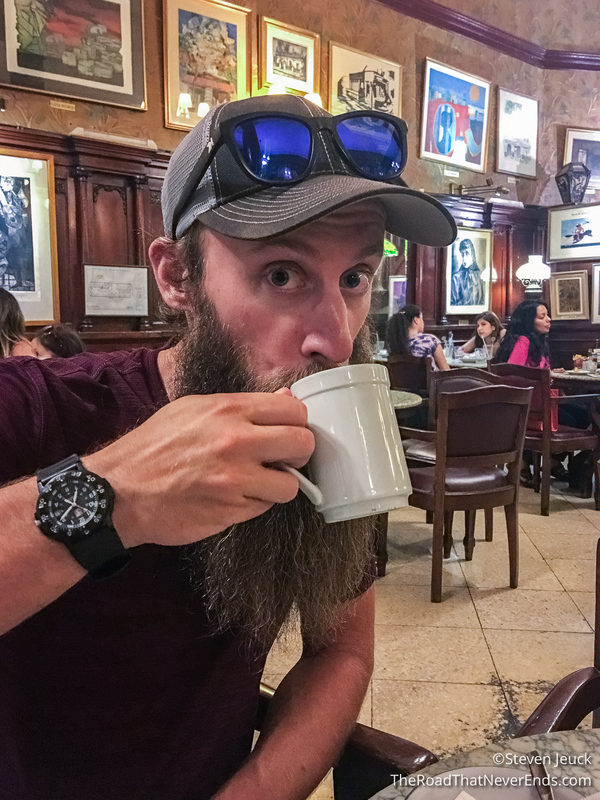 We learned that typical Argentinean dinner is served late, likely after 9PM – which was perfect for Steve. Steve and Diego (Millagros’ husband) are both wine lovers and Steve was eager to tell him about California wine. Diego couldn’t believe we have a whole room dedicated to wine. He was very proud of his country and their wine, and made sure that we didn’t go home thirsty! 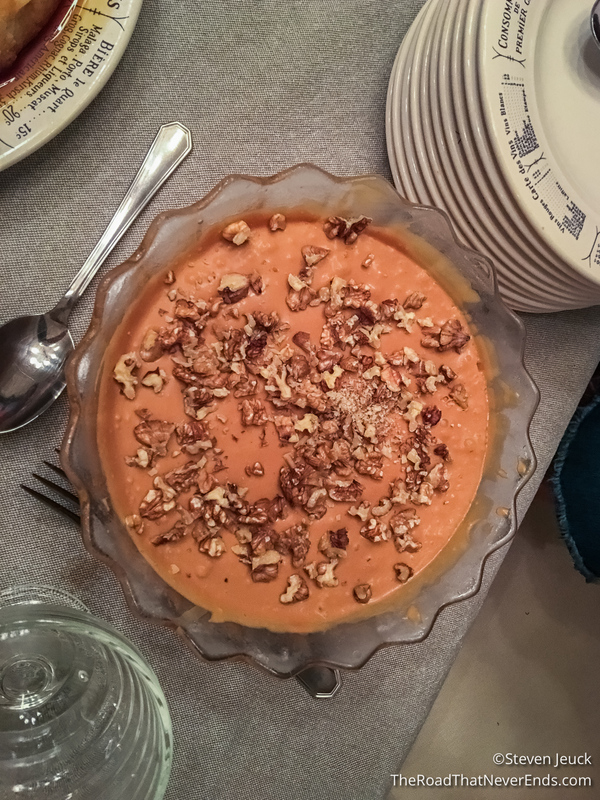 We enjoyed all the food – and especially the dessert, but really appreciated talking and getting to know the Argentina that we have spent the better part of a month in by people who have lived here and love it here. Talking about our visit, politics, and everything in between. I loved talking to Francisco, who has a love for travel and was eager to hear our stories. I hope he makes his way to California to visit us! They were also kind enough to give us a list of things we should visit while in Buenos Aires. They may have just met us, but they treated us like family and gave us the boost in our spirits that we so badly needed. Bruno family – ¡Muchas Gracias! We can’t wait to visit you again, and hope to see you in California soon! A neoclassical building, finished in 1910. Currently holds both houses of Argentine’s congress. We thought the building had spectacular statues and architecture. 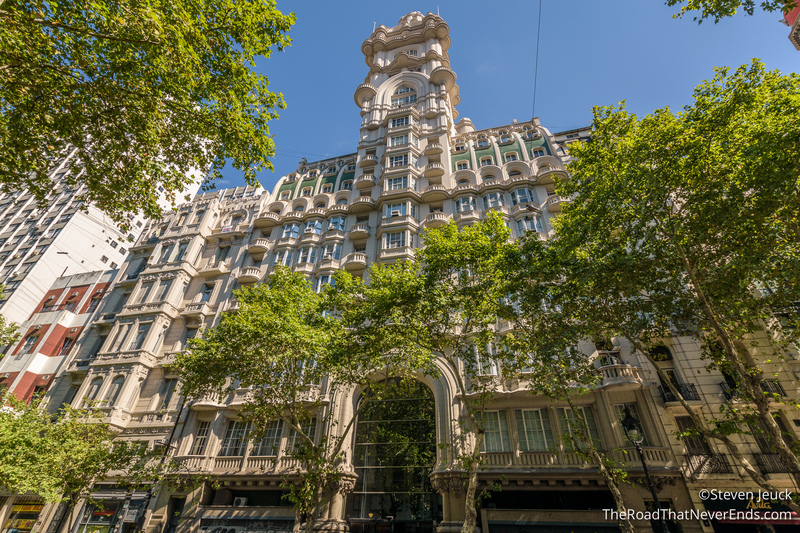 This landmark building has a fascinating history, which reflects Argentina’s rich history in Italian immigration. The building was inspired by Alighieri’s Divine Comedy. The building is divided into three sections: Hell, Purgatory and Heaven. Finished in 1923, it was once the tallest building in Bueno Aires. Today, the building is used by businesses and a school, but you can pay to get a tour of the inside. I think when we return to Buenos Aires, we will add that to our list. 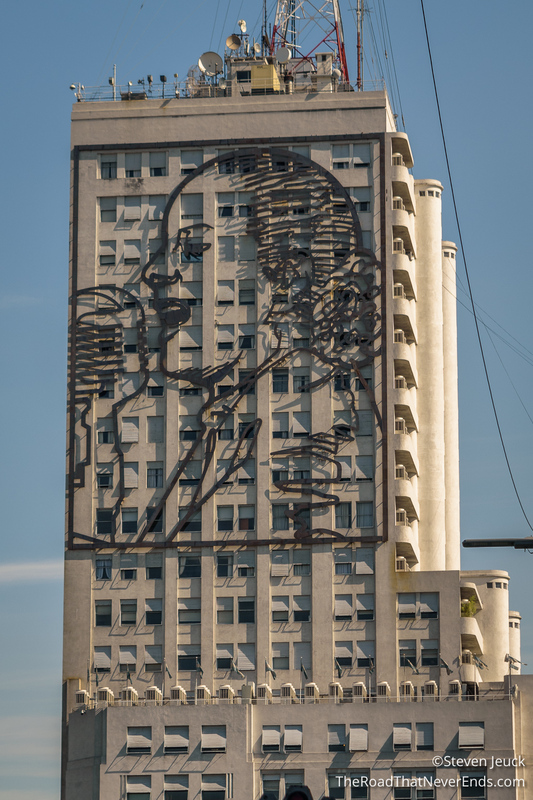 There are two giant murals of Eva Perón (Evita) on the Ministry of Public Works, both made of steel. We only saw the North side, which shows Eva giving a speech. Throughout our travels in Argentina, Eva Perón is regarded highly. 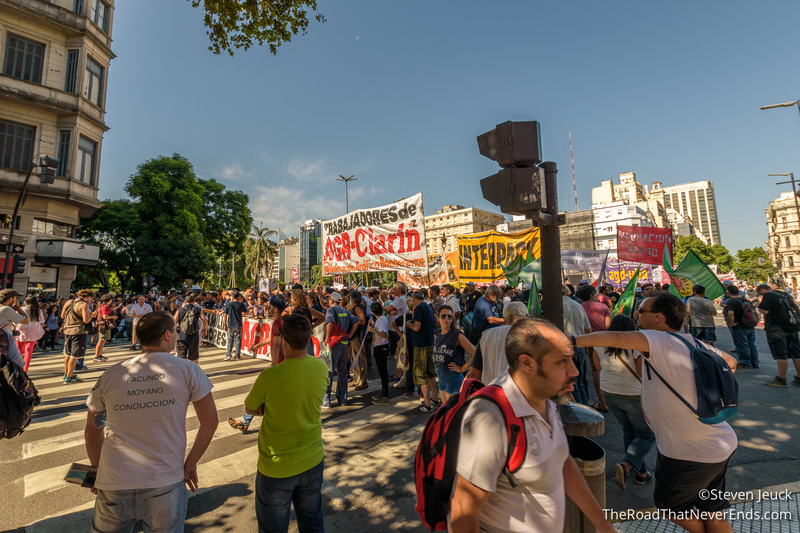 While here, we also witnessed a protest happening in the streets. Our guide told us there are usually two protests a day in the city, with various causes. This one had to do with pay for newspaper writers (from what she explained). Opening in 1858, making it one of the oldest coffee houses in Buenos Aires. The coffee house was opened by a French immigrant, who modeled it after typical French coffee houses. We grabbed a cocktail here and a coffee and enjoyed the atmosphere and décor. There is also a theater inside, where they perform Tango shows frequently, but can be a bit pricy. We loved it here and if we had a bigger budget, would’ve loved to have dinner here. Once the main plaza for trade and merchandise, today it services as a place for political demonstrations and social functions. From the outside this does not look like a church. We were not allowed to go inside because a private event was occurring, but I imagine it would resemble more of a Catholic church. The current Pope, Pope Francis, came from this church. This one broke our hearts. During the dictatorship period, many people went “missing”. Unable to hold any public demonstrations, or ask any questions, the mothers would meet weekly here and walk around in a circle, at times holding their children’s pictures or name. The group became larger and larger as time went on. Today, the group still fights to for human rights. “The Pink House” as I called it, is where the President works (not lives). To my surprise, it wasn’t as big as I thought it would be. This includes the famous balcony where they filmed the for the movie, Evita. 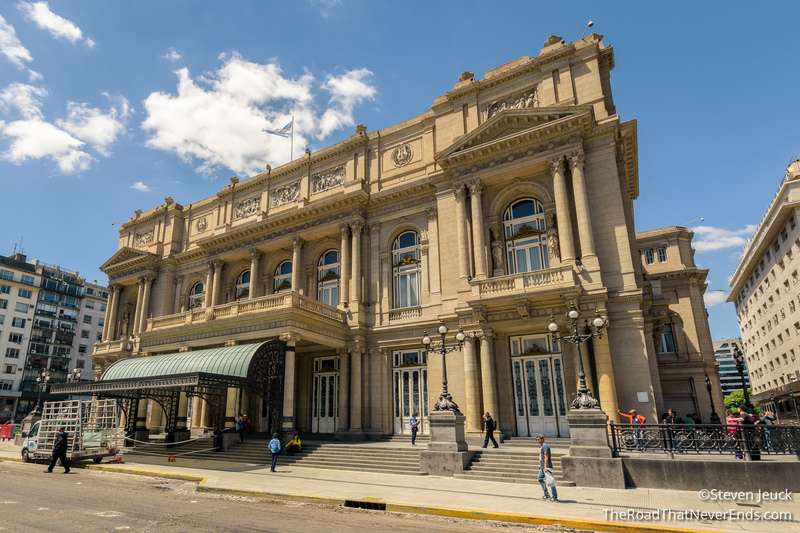 Ranked as one of the best opera houses in the world, and top acoustic theaters in the world – this place is impressive! We were not able to go inside as they were setting up for a show, but as we sneaked a peek in the hall we were dazzled by lights and paintings. The present day theater opened up in 1908 and recently underwent major refurbishment in 2010. This monument is similar to the Washington Monument in Washington DC. 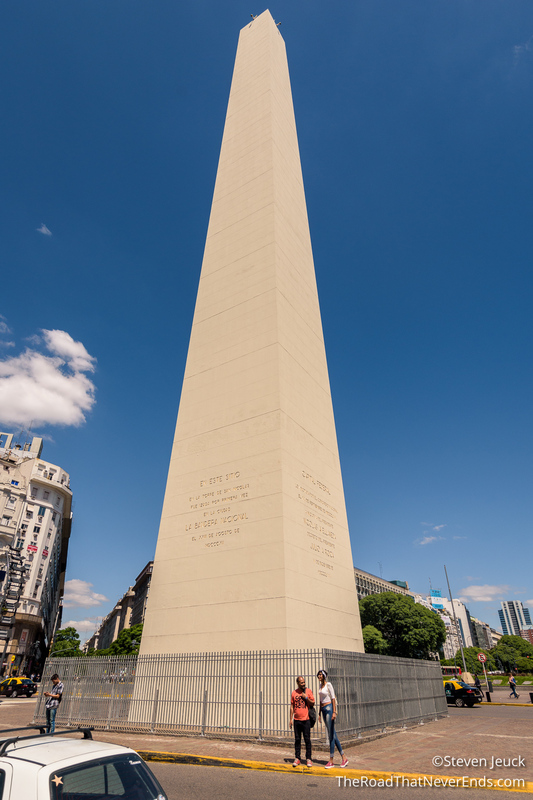 It was erected in 1936 to celebrate the fourth anniversary of the foundation of Buenos Aires. The monument is sometimes decorated for seasons or to celebrate different occasions. In 2005, it was covered by a giant pink condom to celebrate World Aids Day. It was erected on the site of an accidentally demolished church dedicated to St. Nicholas of Bari. 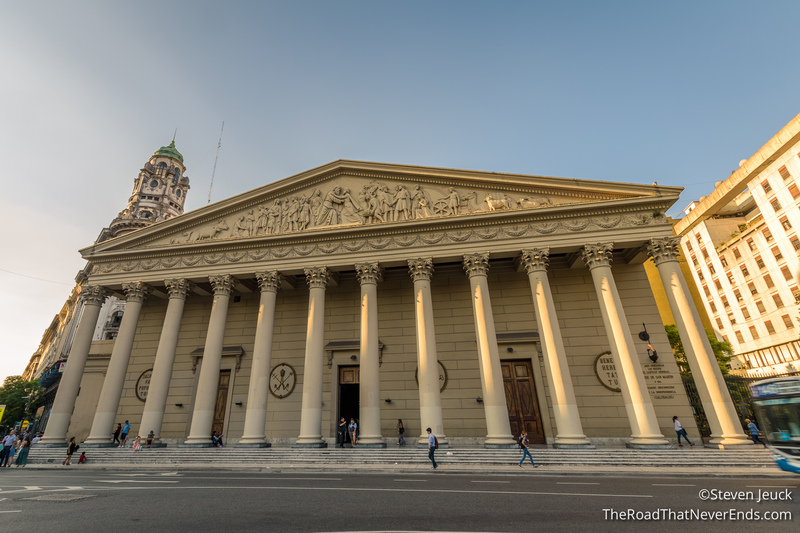 It was on this church that the flag of Argentina was first flown over Buenos Aires. 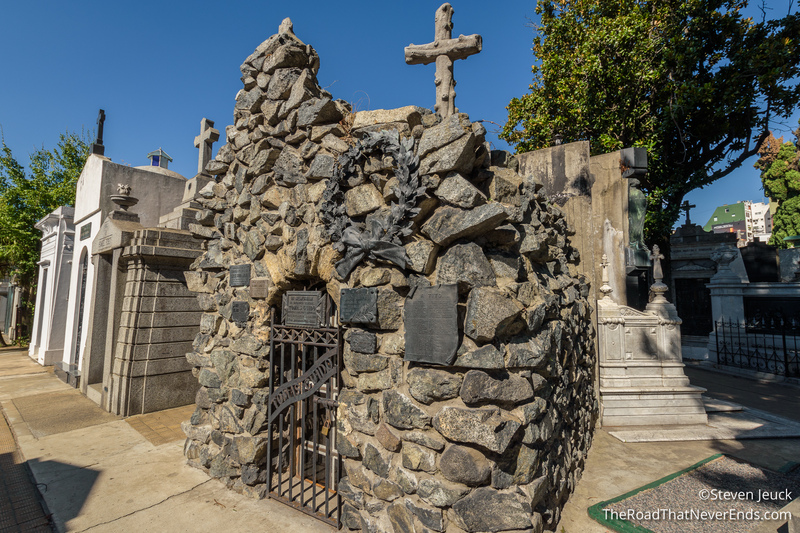 Considered one of the world’s best cemeteries, this place is filled with interesting graves to rival the fascinating people in them. We walked around here for about an hour looking at such artistic graves. 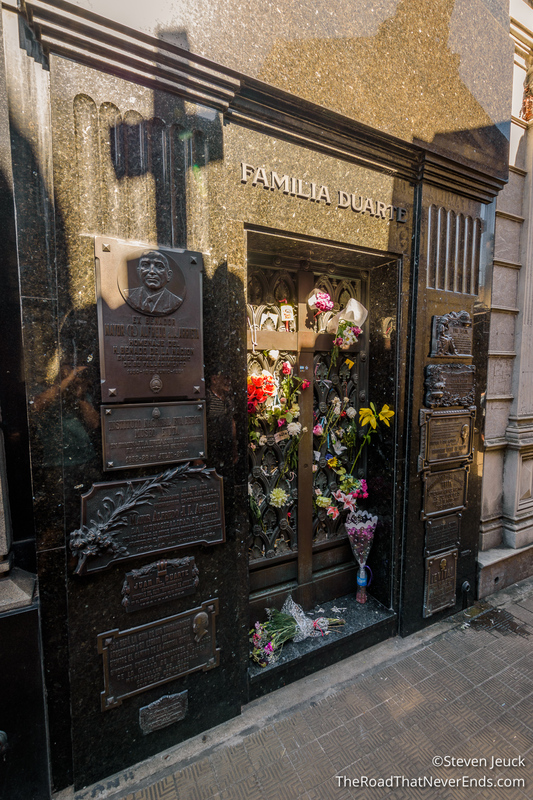 We also made sure to visit Evita’s grave. 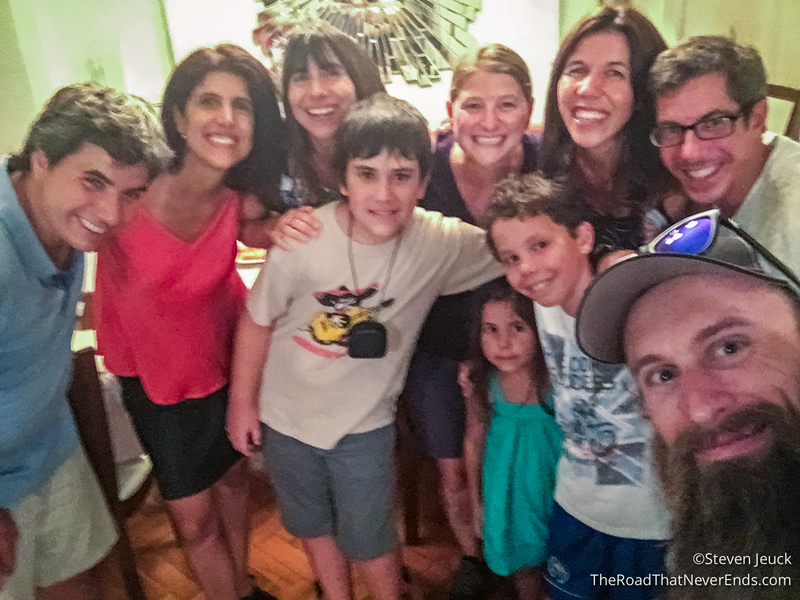 We spent quite a bit of time in Argentina, and really enjoyed the people more than anything. Of course, the views are spectacular too! Wherever we went, the locals always engaged in conversation, eager to hear what we thought of Argentina. The country is rich in culture, hospitality, and adventures. 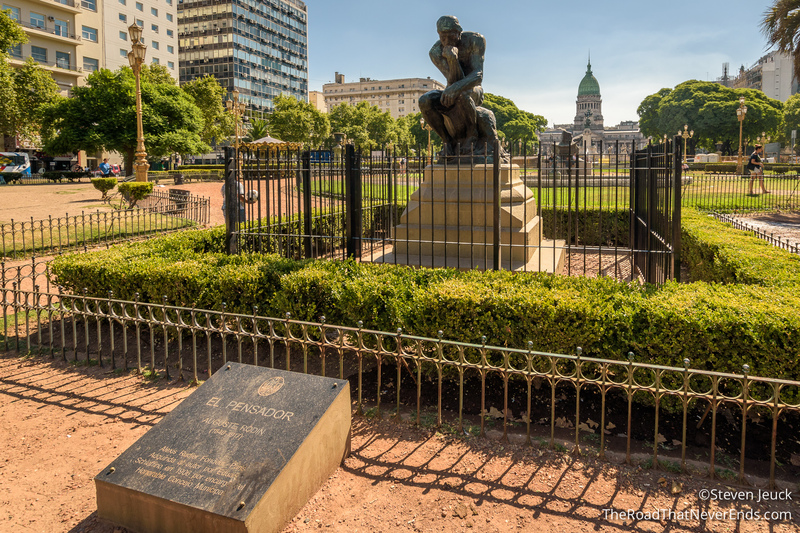 The political history of Argentina, and the current protests & fights make this one of our more fascinating stops on the journey yet. We are heading to New Zealand! I am enjoying your travels and look forward to New Zealand, Stay safe and well. Thank you Aunt Pat! We are really enjoying our trip and are glad to hear you are following along. It keeps us motivated to work on the blog when we know people are actually reading it. Take care, love you!